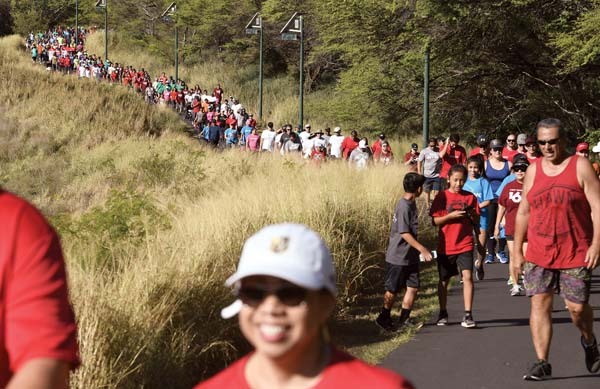 More than 3,000 people attended the Maui Arts & Cultural Center’s 20th anniversary celebration on Saturday at the A&B Amphitheater/Yokouchi Pavilion. The free event included live and disc jockey music; performances by BANDALOOP (first photo), a vertical-performance dance company based in Oakland, Calif.; video mapping on the walls of the buildings; and a fireworks display. MACC President and CEO Art Vento (second photo) joins staff members, volunteers and board members on stage to sing “Happy Birthday” to the Maui Arts & Cultural Center. Pictured on the screen above them is the late Masaru “Pundy” Yokouchi, who played a major role in creating the facility, which opened May 13, 1994.